Uncanny Magazine is thrilled to bring you Hao Jingfang’s haunting story “Folding Beijing.” Translated by Ken Liu, Hao’s story touches on universal themes of love, loss, and family, all while turning an unflinching gaze towards issues of class and population. Since winning first prize in the New Concept Writing Competition in 2002, Hao has published two full–length novels, cultural essays, and many short stories. A selection of her earlier works was published in 2011’s Star Travellers, a collection featuring 14 novellas written between 2005 and 2010. Her short story, “Invisible Planets,” also translated by Liu, was published in Lightspeed’s December 2013 issue. With degrees in physics, economics, and management, the temptation to classify Hao as a hard science or political writer is hard to resist. While she may wrap her stories in an astonishing exterior of scientific theory, Hao brings a lightness and poignancy to her characters and their worlds that defy simple labeling. Ultimately, Hao’s work will make you look at the world a bit differently and, really, that is the highest compliment a reader can bestow upon a writer. We hope to see more of Hao’s work in the future. Uncanny Magazine: Lao Dao is an honorable man who recognizes the inequity of his situation. Yet, this isn’t a grand, sweeping story of rebellion; its heart is much more quiet and personal. In genre fiction, where the idea of dismantling injustice is often a major theme, what made you focus the story on a man’s simple quest to provide a better life for his daughter instead? Hao Jingfang: It’s precisely because political rebellion is such a clichéd theme in SF that I decided not to go down that route. In my story, the unjustness of the world is a part of the background, not a characteristic of some group. The world of the story is unjust, but no individual is the source of the injustice; everyone is simply playing a role. Like a group of actors enacting some drama on a tilted stage, they suffer, celebrate, rage, jubilate, but don’t resist the tilted nature of the stage, which is perceptible only to the audience. The unfairness of the world is revealed for readers, who exist independent of the story, not for the characters. The characters themselves care more about things that touch their daily lives: family, love, power, and wealth, but a reader can see the fundamental inequity of their world. I chose to write this way because I wanted to reflect on our reality. The lives of the vast majority of people play out like stories full of ups and downs, but few ask how these stories reveal the structure of the world. Most people care only about the details of their individual lives: family, love, power, and wealth, and few examine the framework of the world as a whole. The structure of the real world, of course, is also unfair and unjust, like the world in the story, and in fact the real social pyramid may be even more extreme than the one portrayed in my tale. Only someone who can take the perspective of a reader of the world, standing apart from the emotional experience of individuals, can perceive this structural framework. I wanted to reveal this perspective. And, what do we do with this revelation? I wasn’t trying to answer this question. Any informed observer can tell that in a rapidly developing society like contemporary China, disparities of wealth and status are growing wider, faster, but no one has a good solution to the problem. During the last century, multiple attempts at creating fairer, more equal societies stalled. Putting aside the benefits and harms of socialism for the moment, even in the most free and democratic country, the Occupy Wall Street movement ended up accomplishing very little. I think it means a more profound problem is present in the human condition, hinting at an eternal dilemma that will always be with us. A short story can’t resolve such questions. Beijing is a megacity whose scale defies the imagination of many. In this city, individual existence is easily engulfed by the world’s forbidding structure. I just wanted to show that. Uncanny Magazine: “Folding Beijing” is a complicated story that meshes physics, economics, and class systems, yet is it is framed by wonderful domestic details. Descriptions of food and clothing are given as much attention as genre elements. Why did you think it important to include these details in your story? Hao Jingfang: A science fiction story must first be a good story. “Science fiction” is an attribute, but not the essence. A good story must move the reader. Well–chosen details are required to absorb the reader in a new scenario, to make the reader believe it. A science fiction story can’t just rely on some novel premise; no matter how exquisite the premise, without the details that give it vitality, it is nothing but a good idea, a seed for a story. Details are the lifeblood of fiction. Uncanny Magazine: The banquet scene in “Folding Beijing” is particularly poignant. Lao Dao discovers that his world, which his father helped create, is invisible to those in First Space. We also see Lao Ge’s “boss” dismiss a proposal that would eliminate the need for Third Space workers, illustrating a curious mix of problematic compassion and patriarchy. Yet he later delays The Change with a sense of privilege and callous disregard for those outside of his space. Do you see these conflicting ideals continuing or will one set win out over the other as the next generation comes into power? Hao Jingfang: The description of the banquet draws on some of my personal experiences. For professional reasons and out of my own interest, I attended multiple economic conferences: Some of them were closed–door small sessions; others were large forums related to integrated policies. At these conferences and forums, I witnessed scenes similar to the one in my story, and one of the strongest impressions they left me is a sense that the bright, glowing figures shaping policy live in a completely different world from those toiling at the base of the pyramid. The policy–makers know of the existence of the lowly, but they can’t see them. For those with the power to shift the course of the country, the little people are just numbers in a spreadsheet. When the powerful discuss economic policy, they could transform the fate of millions with a single thought, and there are often difficult choices. At one conference having to do with environmental management, I heard a discussion similar to the problem in my story: someone suggested automatically sorting Beijing’s trash, and one of the officials replied that Beijing’s trash was all shipped to a particular place in Hebei Province, where it provided tens of thousands of jobs. If technology replaced the need for these jobs, how would the poor who depended on the stream of trash make a living? The high–level officials in real life often act like the “boss” in my story: They try to plot a middle course between multiple policies, balancing competing interests and futures, and demonstrating apparent compassion. In fact, however, they see the people at the base of the social pyramid as abstractions, fungible numbers that could be shifted from one column to another. A recent example is Beijing’s attempt to manage the growing population and deteriorating environment by administratively resettling many of the poorest people outside of the city. This mix of compassion and indifference is a characteristic of the “paternalistic” government style that is a part of China’s history and tradition. It has been present in Chinese governments for thousands of years, and it will continue to be present in the foreseeable future. Uncanny Magazine: As I mentioned, this story meshes the incredible physics involved in creating The Change, but also the very real economic reasons behind it. You have degrees in both physics and economics and management. In writing this story, what element came first: How to deal with the economic reality of over-population or the physical concept of creating the folding worlds? Hao Jingfang: It began with an image. One morning, I was shopping at a street market just like the one described at the start of the story: Crowded, chaotic, dirty, lively, full of cheap goods piled up everywhere. Everyone was devoted to the task of bargaining. I thought then that Beijing was a city divided into multiple groups who did not interact at all in daily life. They had completely different lifestyles, habits, and socializing spaces—in fact, they rarely even met. My friends and I belonged to Second Space. Due to some measure of talent and luck, we had good educations and comfortable jobs, and we could see the results of our efforts and dream of advancement. But this city also had two other groups we usually didn’t get to see. One group consisted of the mysterious, powerful figures who were rarely seen in public but who could decide the fate of the city, even the entire country. The other group consisted of the laborers who lived in the nooks and crannies and borders of the city. They didn’t have the money to shop at the places we frequented—indeed, they couldn’t even afford to come to where we lived; yet, they, in their multitudes, supported the functioning of this giant city. The image from that morning spun out into a whole story: The economic reality was the logical engine, and the physical concept animated the image. 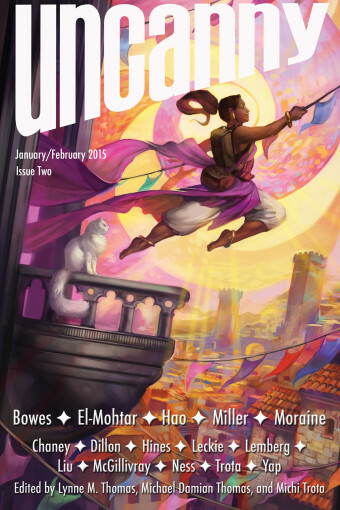 Uncanny Magazine: We are seeing a surge of interest in translated SF/F fiction and fiction outside of the western culture. Has this, in any way, affected how you approach your work? As a writer who has had her fiction translated for the western market, what challenges and opportunities have you encountered? Hao Jingfang: Translated fiction provides me with a great deal of help and inspiration. 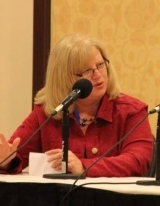 I began writing science fiction because reading translated fiction showed me wonders and opened up new worlds. In the last couple of years, I’ve really enjoyed Neil Gaiman’s novels, which are full of imagination, keen observations, and delicate emotions. I’m glad to see the Anglophone world taking an interest in Chinese science fiction. So far, I’ve only had two stories translated, barely dipping my toes, and so I can’t yet say I’m a part of the western science fiction market. For me, the interest western readers take in Chinese fiction presents an opportunity, but the challenge is that I don’t know if western readers will like the style of Chinese fiction. Uncanny Magazine: Thank you so much for your thoughtful answers and giving Uncanny readers insight into this wonderful story. 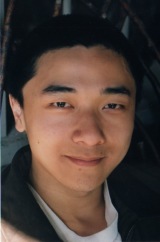 And thank you to Ken Liu for his work in translating both the interview questions and Hao Jingfang’s responses. Ken Liu (kenliu.name) is an author and translator of speculative fiction, as well as a lawyer and programmer. A winner of the Nebula, Hugo, and World Fantasy awards, he has been published in The Magazine of Fantasy & Science Fiction, Asimov’s, Analog, Clarkesworld, Lightspeed, and Strange Horizons, among other places. Ken’s debut novel, The Grace of Kings (2015), is the first volume in a silkpunk epic fantasy series, The Dandelion Dynasty. It won the Locus Best First Novel Award and was a Nebula finalist. He subsequently published the second volume in the series, The Wall of Storms (2016) as well as a collection of short stories, The Paper Menagerie and Other Stories (2016). In addition to his original fiction, Ken is also the translator of numerous literary and genre works from Chinese to English. His translation of The Three-Body Problem, by Liu Cixin, won the Hugo Award for Best Novel in 2015, the first translated novel ever to receive that honor. He also translated the third volume in Liu Cixin’s series, Death’s End (2016) and edited the first English–language anthology of contemporary Chinese science fiction, Invisible Planets (2016).